Pen-y-Cymoedd farm, Wales' largest onshore wind farm has generated electricity for the first time last month and is on target for completion in April 2017. The £365m Pen-y-Cymoedd farm is being built between Neath and Aberdare by Swedish developers Vattenfall. The company said the breakthrough was "one of the biggest boosts this decade to delivering Wales' green energy targets". The 250 megawatt, 76-turbine scheme is set for completion early in 2017. 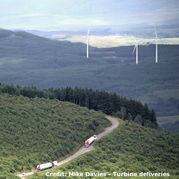 In a joint venture Jones Bros and Balfour Beatty delivered infrastructure for the project, Wales’ largest wind farm and bigger than any English project. It is expected to produce enough power annually to meet the electricity demand of more than 188,000 UK households and will more than meet the domestic demand of host local authorities Rhondda Cynon Taf and Neath Port Talbot. Over the lifetime of the project, it is expected to save 6.4 million tonnes of CO2. See a birds eye view of the project.